Built in 1997, this convention center is known as the World’s Best Congress Center 2014 and 2004. Today, the center hosts wide range of events like concerts, exhibitions, meetings and conventions. 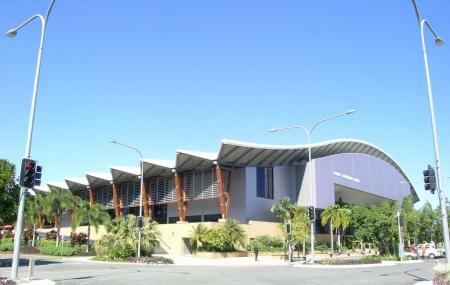 All the major national, local and international acts of Cairns are held in this center. Popular event like Australia’s national basketball league was held over here. Free parking space is available. The centre is wheelchair accessible with ramps and elevator. Underground parking is also available from the western side of Sheridan Street. Please enquire before you visit. Love this? Explore the entire list of places to visit in Cairns before you plan your trip. Fancy a good night's sleep after a tiring day? Check out where to stay in Cairns and book an accommodation of your choice. How popular is Cairns Convention Center? People normally club together Kuranda Scenic Railway and Cairns Museum while planning their visit to Cairns Convention Center. Great space for functions ideally located on the edge of the city. Not a lot in the way of parking to be honest which is a bit of a let down and facilities have obviously borne the brunt of budget cutbacks with cheap toilet paper and empty soap dispensers. The actual spaces are clean and in good repair but function coordination could use a little more common sense as most events I have attended have had terrible and unnecessary congestion at the entry point which holds up overall efficiency and creates frustrated clients/customers. Better signage, staff to usher people in appropriately and overall improved communication and attention to detail would be a boon to what is physically a world class facility. For a small town it's a wonderful facility. However the design is definitely not user friendly/intuitive. One could spend 30 minutes trying to find the carpark and more looking for a pay station. Great venue for physical entertainers and enterprises around the world. One of the best basketball stadiums in Australia and the staff were very friendly. Went for the Florida Georgia Line concert. Bundy rum (the main spirit) ran out 10 mins after the 1st artist started. ALL drinks had run out before 3/4 through the show. Very very poorly organised considering that the same concert the night before they also ran out of rum and it wasnt a sell out crowd as the 2nd night was. A lot of people very unimpressed.